How do I know I have new PlaceMakers Supplier Invoices? – Welcome to the NextMinute support and feedback centre. As a user, we welcome your ideas and feedback. As part of our continuous product improvements, the most popular ideas will be the top of our development schedule. Don't forget to vote for the ideas that you want to see included in NextMinute. What is the difference between Admin users and Mobile users? How do the printing options work in Invoices and Quotes? How does the contact search functionality work? What are tasks and how are they best used? Home - What does the Dashboard provide? How do I know I have new PlaceMakers Supplier Invoices? Why can't I make changes and add sections to my Quote? 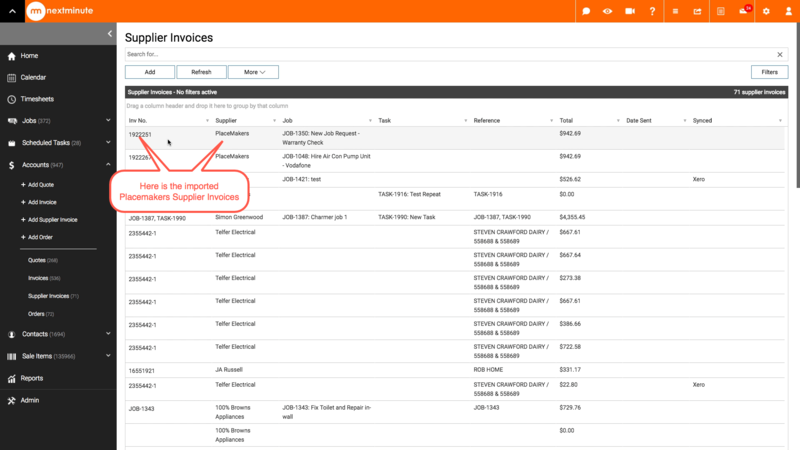 When you log in to your NextMinute subscription you will see a prompt letting you know you have new PlaceMakers Supplier Invoices to import (as shown below). You can import these straight away or import them later via Accounts > Supplier Invoices > Add > Import from PlaceMakers. 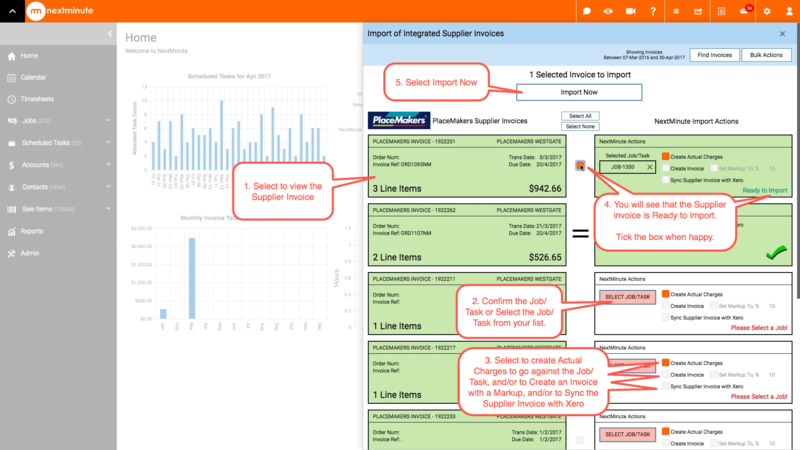 For a more detailed explanation on importing your PlaceMakers Supplier Invoice see the Import PlaceMakers Supplier Invoices into NextMinute article. Step 1: When you have new PlaceMakers Supplier Invoices you will see the prompt shown below. 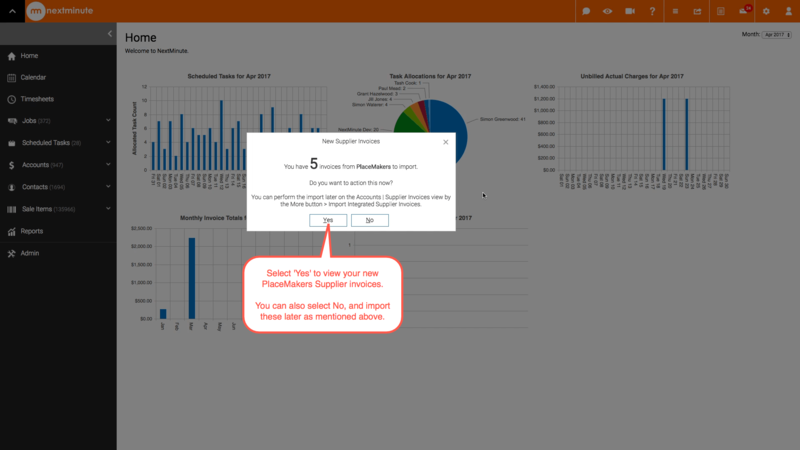 This prompt is shown when you first log in to NextMinute for the day, if you have new PlaceMakers Supplier Invoices to import. Tick to create Actual Charges - this will assign the line item charges from your supplier invoice against the selected Job or Task as Actual Charges. These will be displayed as unbilled charges. Tick to Create Invoice (with the option to add % mark up) - this will create an invoice for directly on-billing to a customer, you have the option to add a % mark up. Tick to sync this Supplier Invoice to your Accounting Provider (Xero or MYOB) - this will create a supplier invoice record to your Accounting Software. 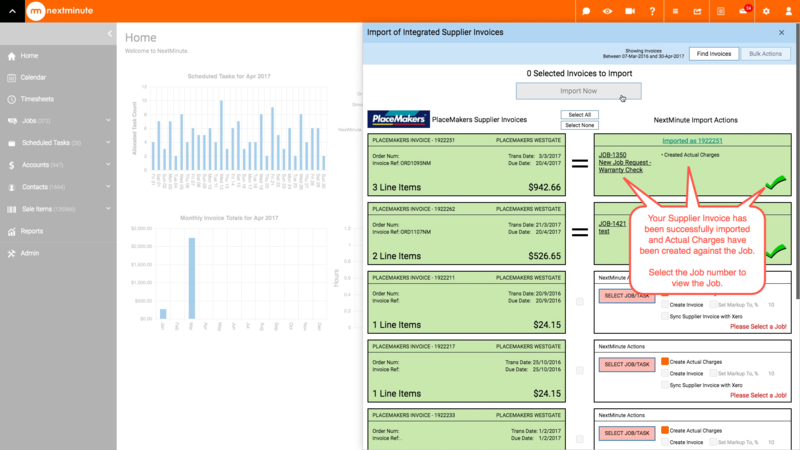 The Supplier Invoice will then show as being successfully imported.